I’VE LOST MY PHONE / WALLET / OYSTER CARD. . .
Our #1 most-asked question tbh. Email us and we will try to help. CAN I WRITE SOMETHING ON THE CINEMA SIGN? Yes. We make dreams come true, info here. IS IT A COCKTAIL BAR OR CLUB? Basically both. In the Cocktail Bar (turn left at bottom the stairs) we have a seasonal cocktail menu, table service and are open Tues–Sat for bookings of 2–12. 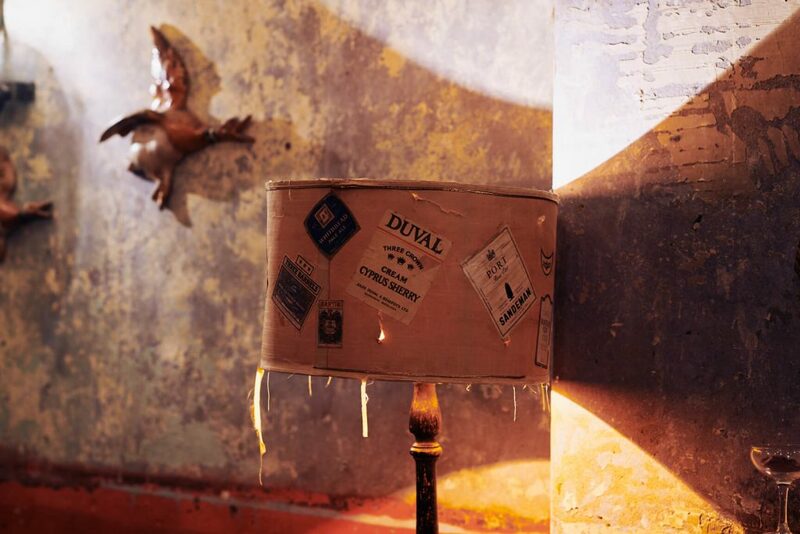 Our Lounge Bar (turn right at bottom of the stairs) is bigger and more relaxed with live DJs and a dance floor. No table service but we do have cocktails + draught beers, wine, shots etc). Areas can be booked for 10–60. Good vibes party music. Inclusive, welcoming, fun stuff. A mix of 70s disco, 90s R&B, camp classics, old school garage. Anything that makes you dance, We’re not really into repetitive beats music or anything too genre specific. CAN YOU GO FROM ONE BAR TO THE OTHER? Yes. We recommend starting with some nice gentle drinks in the Cocktail Bar before moving through to the Lounge Bar for a dance. Sadly, the conditions of our licence mean that you can’t take drinks between the two bars. 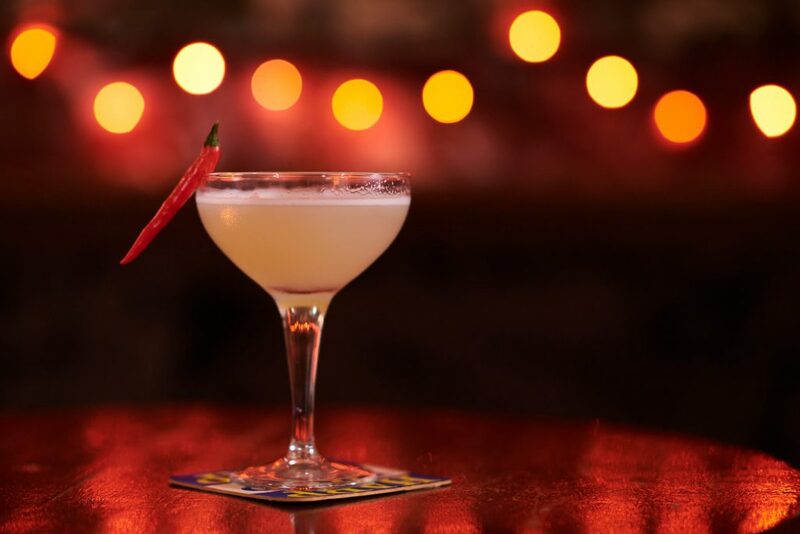 Hands down, the Chilli Apple Martini. First created in 2012, it has attained cult status and a loyal following. Yes, Fridays 7–9 in the Lounge Bar. On Tuesdays in the Cocktail Bar, we have #rubystuesdays where all red drinks are £5. CAN I PRIVATE HIRE THE VENUE? We don’t offer exclusive hire of the venues on a Friday + Saturday but you can hire areas for 10–60 in the Lounge Bar. If you’re looking at another day of the week, email us. No. We did for a little while but the best we do now is nuts + olives. CAN I BRING CAKE? AND BALLOONS? Yes, we’re cool with that. Email us and we will store and cut (promise we won’t eat). Balloons are cool too (but don’t go wild). We do make cocktails with nuts, eggs + dairy so if you’re allergic to anything please let your server know. No, it’s free. Occasionally there will be a special event with an entry fee but this will be listed on our events page. No. We welcome all styles. CAN I HOST A NIGHT? If it’s a good one, email us. I LOVE RUBY’S. CAN I HAVE A JOB? We’re always on the look-out for staff, particularly weekenders. Email us. CAN I DO A PHOTOSHOOT OR FILM AT RUBY’S? Yes. Info here if you’re in that game. TELL ME MORE ABOUT THE HISTORY OF RUBY’S . . . The premises was originally a Chinese takeaway called Ruby House 3. We took over in 2012. We liked the name, so we kept it. 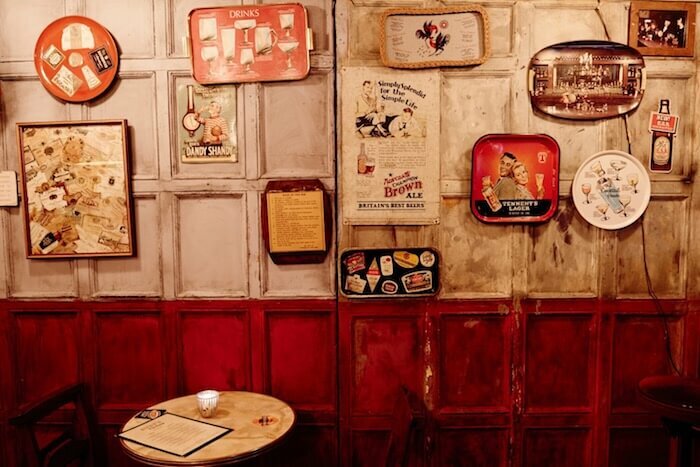 We love old stuff and both bars are packed with much-loved antiques including a 1920s chandelier + a treasured collection of vintage drinks trays and beermats. WHAT IF I HAVE A QUESTION THAT ISN’T COVERED IN YOUR EXTENSIVE FAQS? Email us. We love to chat.